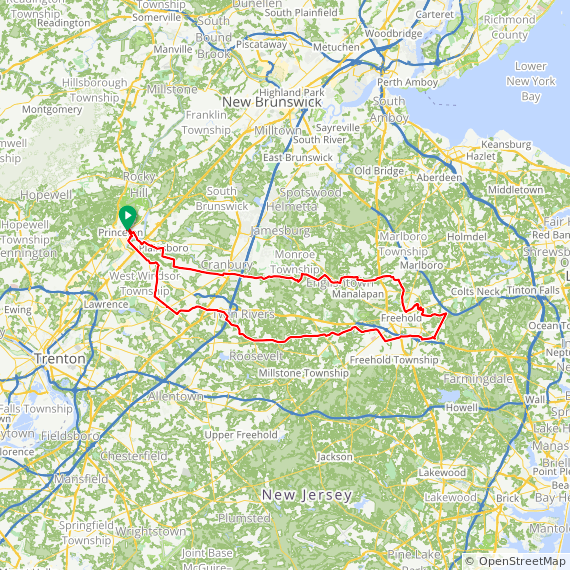 jlippinbike | A blog by a recreational cyclist from Princeton, NJ for recreational cyclists who live in the Princeton area! A blog by a recreational cyclist from Princeton, NJ for recreational cyclists who live in the Princeton area! I’d been thinking the last couple of days of getting out on the bike to do a simple 100k ride. Been a little cooler than I liked. Or a little more windy than I liked. Or I just wasn’t in the mood to do a ride that long. I still wasn’t really in the mood to do a ride today. But I needed to do one. Even though it was still kind of windy. The temp got up to the mid-70s by mid afternoon. So I went. Chose to do one of my easiest perm routes. Had a headwind going out. And something of a tail wind coming home. I forgot to to reset my Garmin device recording mode at the actual start. About 2 miles into the ride I remembered. I kept the clock ticking for two miles after I finished the ride so I would have a time to put down for RUSA. Today I was riding my Cinelli. I still have not cleaned up my Felt bike after riding it on Saturday in the rain. Most of today’s ride I did in the 39T chainring. It was an easy ride. Click on the map below to see the file I recorded and uploaded to RWGPS. A really good video on proper running technique. Today’s ride was my third RUSA calendar event for the year. It’s the only one I have chosen to sign up for this year that doesn’t have a strategic motivation behind it. What I mean by that is that by riding it I won’t be working toward earning any of the RUSA awards. Today’s ride was 250 miles with 14,300 feet of climbing. It began at 4AM in the rain and dark in Easton, PA. There were around 30 other entrants on the starting line. Early on I was having problems seeing. My glasses were soaked, and fogging up. The bike trail I was riding in the dark had many poles or posts sticking up in the middle of the path supposedly to slow riders down when coming to stream bridges. I was supposed to be riding with three guys who are going to ride with me on May 3rd in another day-long ride. Things didn’t work out as planned. But I don’t believe it was my fault. Oh well. In any event, by riding slow at the outset I rode with many riders I met over the past two years, but never have I actually ridden with them. It was interesting. And I had a really good time “meeting” a new segment of the randonneuring community. I ended up riding the last 50 miles of the event alone. And I finished with 5 minutes to spare in order to beat the 24-hour “cutoff.” It wasn’t really a cutoff because I was allowed 27 hours to complete the ride and get credit for it. But anything slower than 24 hours for a 250-mile ride would have really disappointed me. Today’s ride gets me up to 3500k of RUSA miles for the year so far. My goal for April is to have at least 4000k of RUSA miles before May 1 comes around. That will pretty much assure me 10,000k of RUSA miles by the end of September at the latest. However, I would really like to have 10,000k before September 1 comes rolling around. 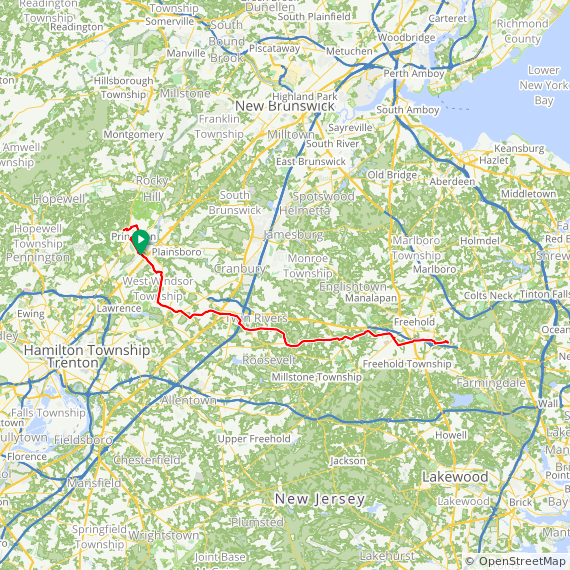 I recorded my ride today using my Garmin eTrex device. Click on the map below to see the ride details at RWGPS. Finally found some time and motivation to go for a ride this afternoon. It was a pretty nice afternoon for a bike ride in most ways. However, it was a bit windy. I benefitted from the wind on the way to Freehold. But I had to deal with it in my face on the return ride. Then sun came out about third of the way into the ride. I think the temp was around 60 degrees or so, give or take. I don’t recall passing any cyclists out doing what I was doing. I was riding my Cinelli. Today’s ride was my quickest 100k for the year. I was not trying to make good time. But I was not loafing either. Stayed in the big chainring (48T) until right at the end when climbing back to the 7-Eleven on Nassau St in Princeton. Click on the map below to see the ride detail at RWGPS. I showed up this morning at Village Park in Cranbury to participate in the PFW B+ ride that I used to do often, but haven’t done much for the last 4 years. I knew most of the 8 other guys riding. So I guess I’m not all that detached. The roads were damp when we departed, and there was no sun. The temp was in the upper 40’s. The pace was between 19 and 22 mph for the first third of the ride. Then for some reason it tapered off at times. The funniest thing about the ride for me was the conversation we had at the break stop in Allentown. One guy’s saddle was a little loose. So the discussion turned to how the saddle should be positioned and what kind of saddle was ideal. One of the guys had let his saddle point up in the front. Most had them pointing down. I’m a big believer in a level saddle. Then the guys took a look at my saddle and a few shouted that my saddle was equivalent to a sofa. I admitted that it was a bit big and cushie, but it served me well on rando rides that exceed 250 miles. I was riding my Cinelli today which I typically use on the longer rando rides. By the end of the ride the sun had come out and the road had dried off. We were all feeling pretty good. I think today’s ride qualifies as a speed workout for me. Next weekend I’ve got a 400k rando ride to do in PA. But I hope to be back doing this B+ ride the two Saturdays thereafter. After that I’ll be doing a rando ride every weekend until mid-June. 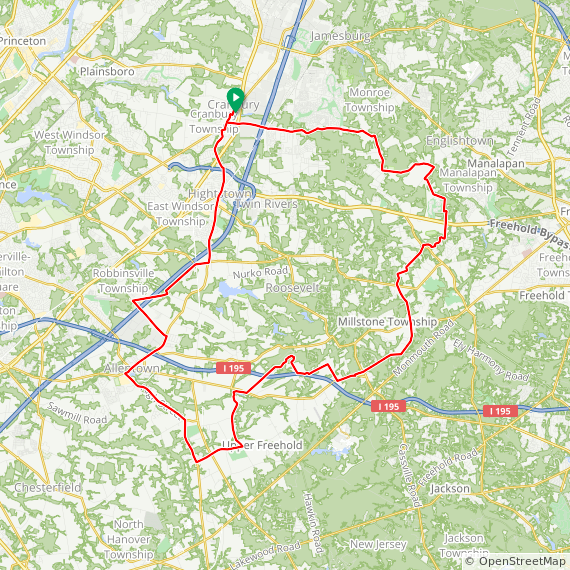 Click on the map below to see the ride details at RWGPS.